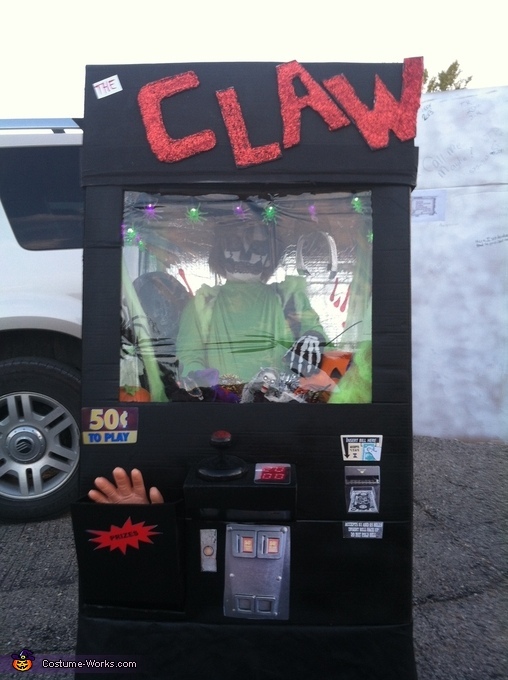 My 7 year old son loves to play the claw game! So when asked what do you wanna be he said inside the claw machine! We made it halloween themed ! We use cardboard and fabric and plastic for the machine. Foam and birthday Tierra's torn apart for the claw. A v smile remote took apart and painted for the control stick. We went to Walmart took pictures of the parts of the machine printed out and placed. We uses a back pack and zip tied it to the inside place foam as a base to fill with halloween decor! Painted his face and hair and made his night!!! Kids crude wanting to play it and a kid tried to put a dollar in it !! We also put lights in it to help the effect! very original! This is real creative! This is so AWESOME. This is one talented mother and EVERY year she goes all out on her childrens costumes. I look forward to her original designs EVERY year. so awesome! i love everything about this! SO awesome and original! Well made! Great costume, that's so creative! What a clever costume!! So crafty!!! Talk about original!!! Love it! Awesome costume! Can you email me the instructions?